Ready for a new look at the office? Check out these 11 easy Business outfits for some brand new ideas. Check out this trendy high contrast look from YourFashWorld. This outfit is an easy stunner because the colors do all the work for you. The simple black pants and accessories are really made into a killer outfit by the classy bright blouse. These pieces are probably already in your closet, now you only need to throw them together and walk into work with a smile to top it off. All this beautiful two piece from HerCanvas needs is a basic tee or colorless blouse to really make an easy stunner. Accessorize accordingly and bam! You’re the most put together, snazy chic in the office. This piece doesn’t only look easy and trendy but also very comfy, an important factor for all day wear outfits. Maybe you’re having a bad day and just want to wear something easy and super comfy or maybe you’re just tired of blouses and suit pieces. Either way, this stunner from HerStyleCode looks comfy enough to wear to bed without looking like you did. Need something to look more business? 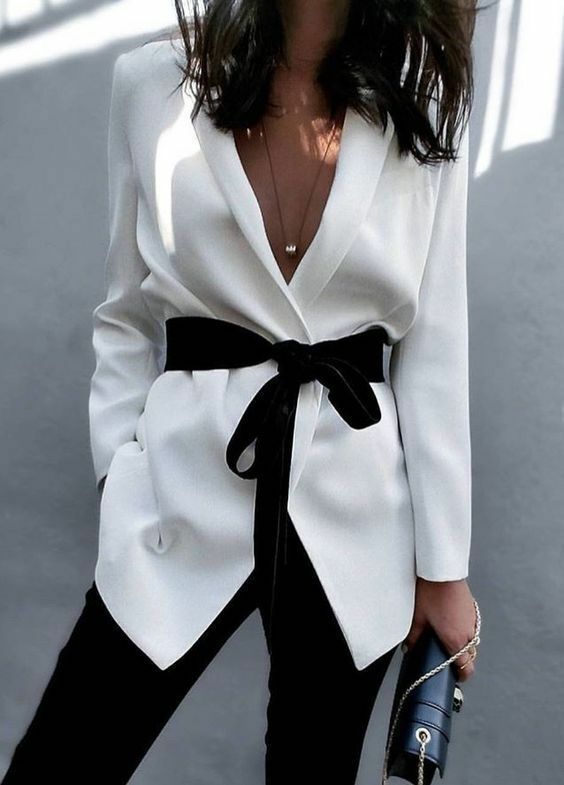 At TrendWear4You their 57 Cute Blazer Outfits give so many ideas to help give an easy business boost to your casual wardrobe. Layer it. Layering is a very easy way to bring more visual interest to your outfit. Be careful not to overdo with accessories, but other than that, you look fab! Bring in some color . Beautiful pinks and whites make a lovely outfit for spring or summer. Add a belt. That’s right. You put a beautiful classy outfit on… now snaz it up a notch with a simple belt. The small things make all the difference, especially when coming to the visual. Don’t you just love this look? Another high contrast, you can’t go wrong with basic black. Put it together just right and wow you look so classy and chic without even trying. Talk about it! Here’s a daily eye pleaser from nonagaya for you! Simple, easy, and stunning. The beautiful textures of the blouse and tie do everything for you. Isn’t this classy outfit from StylishWife just so pretty? Simple colors, but that skirt and blouse combo just bring easy classy to a whole new level! Those accessories are just perfect. They take the outfit from pretty to stunning in that simple gold/black. This outfit says “boss lady” like none other. What a gorgeous combination. Not only are the colors great, but the texture of the beautiful dress. Simple, easy, stunning.